As a leader in the cloud-based practice management software space, Curve is the top cloud-based option for solo practices. As one of the first companies to specialize in cloud-based dental practice management software, Curve Dental is one of the most modern solutions on the market. The software is purely web-based, so both Mac and PC users will be able to use it —- many locally hosted solutions are PC-oriented, so this is an especially nice perk for Mac users. Is Curve Dental the right software for you? Since Curve is hosted entirely on the cloud, users can spend less time dealing with IT issues, and more time focusing on what they do best: treating patients. As dental practices become more aware of the value that cloud-based software provides, we believe that top cloud vendors like Curve will continue to become increasingly popular compared to larger, more traditional competitors. Though some of the more traditional players on the market are also beginning to offer cloud-based products, it’s not their specialty—which means that they’ll likely face growing pains in their transition, and they’ll be forced to spend time solving problems that Curve has already managed to solve. $350/month base price, with other packages costing more. Founded in 2005, Curve was designed to work directly in a web browser, without having to be installed on a local server. Today, it’s one of the most modern solutions on the market, currently serving more than 2,000 dentists. Because Curve stores all of your data in the cloud, you’re able to access the software securely from home, the coffee shop, or wherever. This is especially convenient for dentists looking for flexibility from their PMS, and who want to be able to consult their schedules and patient records outside of the office. Dental practice management software has traditionally been client-server based, which means that all of your data is stored locally on one of your servers (and possibly backed up on additional servers). Users then have to spend lots of time and money to set up and maintain their servers, as well as updating their software, which is all outside of their core competency of treating patients. Curve was designed to help dental practices avoid these headaches by taking care of all of these technical issues for you. With Curve, you don’t have to install any software on your computer to get started—you simply need to sign in through your web browser. Since all of your data is hosted in the cloud across multiple locations, your data is guaranteed to be automatically backed up in a secure, HIPAA-compliant manner, which removes the need for you to purchase expensive hardware for data storage, or to pay IT staff to manage servers. Curve also has many features to help you move towards a paperless practice. The software includes a patient portal that allows your patients to fill out forms and pay bills online. Curve’s imaging technology enables you to capture images with your sensor or camera, and send them directly to the cloud so they can be accessed anywhere you have an Internet connection. With its intuitive user interface, easy accessibility, and comprehensive set of features, Curve is a top choice for dental practices that are seeking a modern web-based solution to help them with everyday tasks. Most (>75%) of Curve’s clients are solo practitioners. Below, we discuss the key features of Curve, and how they can benefit your practice. Curve’s imaging, charting, and treatment plan modules are all tightly integrated, so that you can easily view all of the patient’s relevant information in one browser window. With Curve’s imaging module, digital x-rays are captured directly to the cloud, where they are backed up and stored across multiple servers. The software has many image enhancement features that allow you to modify images to your liking. For example, you can rotate and sharpen images, and adjust the brightness or contrast as needed. The software also stores the history of each image transformation, so that you can always revert your changes if needed. Another nice time-saving feature is that the imaging module allows you to save a series of commonly performed image edits, so that you can quickly apply the same adjustments to future images. Note that Curve integrates with many sensors, but you should confirm that your sensor of choice is supported. Digital x-rays and patient history can be easily accessed from the odontogram to help you determine the best treatment plan for the patient. Curve has dedicated a lot of time to making its odontogram look attractive and intuitive, compared to other odontograms on the market. 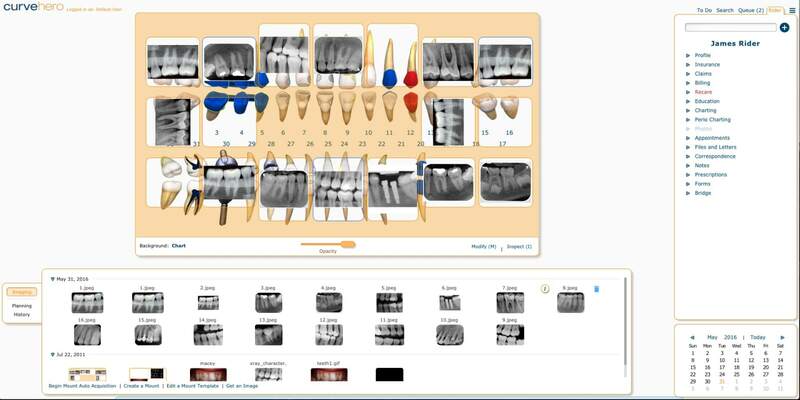 By clicking on a tooth in the odontogram, you can pull up the relevant images and procedure history of the selected tooth, or apply certain procedures. If you apply a procedure to a tooth, the procedure will automatically get added to the treatment plan, along with the relevant procedure codes. Curve’s colorful appointment system is attractive and easy to use. 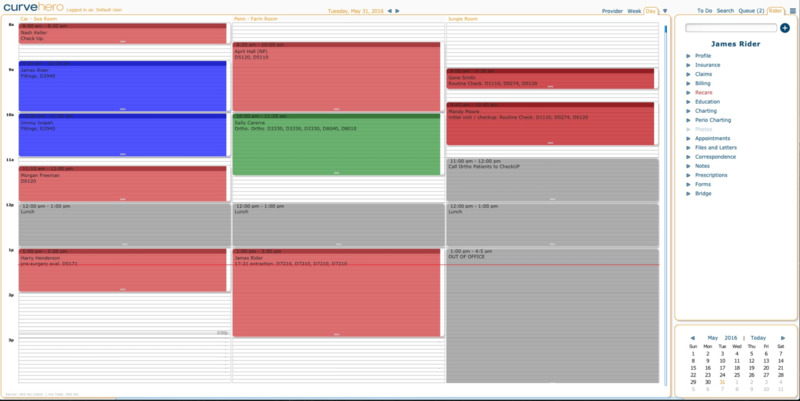 The color-coded appointment book streamlines the scheduling and registration process, and has all of the functionality that you would expect from a scheduler, with some nice additional touches. And, since the software is web-based, users can access the schedule anywhere they have an internet connection. The appointment book is integrated with other parts of the program, including patients’ treatment plans. This makes it easy to schedule recurring appointments with the correct frequency, and automatically allocate the correct amount of time for each appointment, based on the prescribed treatments. You can also make each appointment on the scheduler as detailed as you want by adding specific notes and reminders for each appointment, and by adding procedure codes. Each patient’s profile is directly accessible from the scheduler, which makes it convenient to quickly look up patient information. Patients can fill out paperwork at home prior to coming into the office, or complete their additional documentation or any custom forms from a tablet once they arrive. This helps make the check-in process go smoothly. Curve’s billing module is tightly integrated with the rest of the software, which means that as soon as an appointment is finished, the appointment information is immediately ported over to the billing module. Each procedure is tied to a statement, which makes it easy to keep track of how much was billed to insurance, and how much was billed to each patient. 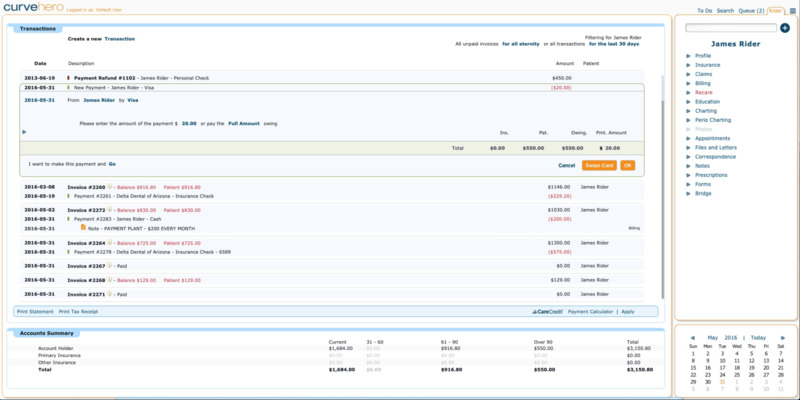 If you need to add payments or make adjustments, you can do so by clicking on the relevant statement and making the appropriate changes. The software also automatically generates statements that are easy to read and are complete, with all of the necessary information to get paid. Curve enables users to send prescriptions electronically to any pharmacy in the US. This makes writing prescriptions fast and easy, and can also help identify any potential drug interactions, based on the patient's history. E-prescriptions are especially important for doctors in NY, due to New York's I-STOP law, which mandates that prescriptions for both controlled and non-controlled substances be submitted to pharmacies electronically. Curve comes equipped with a suite of ready-to-run reports that you can use to help better understand your practice’s performance. You can also create your own custom reports or modify existing reports by using a dropdown menu to select all of the fields that you’d like to analyze. As long as Curve collects the metrics that you’d like to analyze, they can be added to any report. Analyze financial performance by insurance provider. Aggregate data by patient demographic and medical information. Identify patients who are due for follow up appointments, but are unscheduled. Analyze frequency of various treatments, and corresponding financial performance. All reports can be downloaded as comma-separated (CSV) files or PDFs, so that you can analyze them outside of the program, and also share them with other team members. Reports can also be saved to Curve’s cloud database, so that you can access them anywhere. Curve is a top option for modern dental practices looking for a complete practice management software hosted on the cloud. Curve has been completely dedicated to developing dental software for the cloud since 2005, which means that it has already overcome many of the challenges that their more traditional competitors will face as they try to build out their cloud offerings. Curve is especially appropriate for solo practices (which comprise over 75% of its customers), though it does have some multi-location clients. If you’re looking to take advantage of all of the benefits that the cloud has to offer, and are looking for a trusted cloud-based software provider with a track record of satisfying clients, then we highly recommend looking into Curve. To learn more about Curve Dental, you can visit their site here. You can also read our interview with Dr. Carlos J. Huerta, owner of The Dental Boutique, to learn why he favors cloud-based dental practice management software (and Curve Dental specifically), and how it has benefited his practice.